This blog is about yet another example of a powerful new methodology spawned by intense scientific interest in using CRISPR-related technologies. This near mania for all things CRISPR is reflected by there being ~5,000 (!) publications already in PubMed only ~5 years after seminal papers appeared. I chose the present blog topic because it involves use of CRISPR for genome-wide identification of functional long non-coding RNA (lncRNA) in human cells. In an earlier blog about lncRNA, which are now recognized to be regulators of gene expression encoded by what was originally defined as “junk” DNA, it was pointed out that it is inherently difficult to experimentally identify such regulation by lncRNA. Thanks to CRISPR this task is now much less daunting as you’ll learn below, following a couple of introductory sections to set the stage. Qi et al. 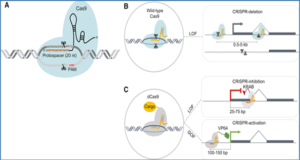 very cleverly—at least to me—recognized that the CRISPR/Cas9 system could be repurposed as an RNA-guided platform for sequence-specific control of gene expression by finding a catalytically inactive mutant Cas9 protein that lacked exonuclease (i.e. cutting) activity of wild-type Cas9, and instead blocked transcription by RNA polymerase (RNAP), as depicted below. These researchers coined the overall process as “CRISPR interference” (CRISPRi) and loosely referred to such a mutant Cas9 as “dead” Cas9 (dCas9). Taken from Qi et al. Interested readers are encouraged to consult this publication by Qi et al. to fully appreciate the extensive amount of work that went into translating the above concept into practice, and supporting the proposed mechanism of action. In my opinion, it’s a tour de force example of applying hypothesis-driven, state-of-the art molecular biology to devise a new method—in this case specifically blocking transcription of a DNA region using CRISPRi in conjunction with target-specific short guide RNA (sgRNA).